Genea-Musings: Treasure Chest Thursday - Post 309: 1753 Marriage Record of Zechariah Hildreth and Elizabeth Prescott in Westford, Mass. 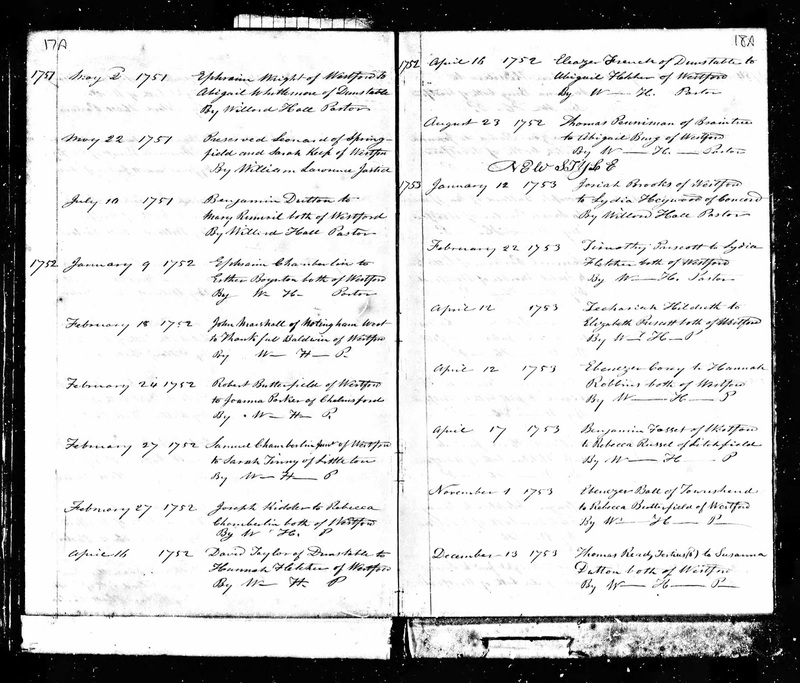 Treasure Chest Thursday - Post 309: 1753 Marriage Record of Zechariah Hildreth and Elizabeth Prescott in Westford, Mass. Massachusetts, Town and Vital Records, 1620-1988, digital images, Ancestry.com (http://www.ancestry.com), "Westford Births, Marriages and Deaths," page 18A (image 430 of 1733), Zachariah Hildreth and Elizabeth Prescott marriage entry; citing original data from Massachusetts town and city clerk records in Jay and Delene Holbrook, Massachusetts Vital and Town Records (Provo, Utah : Holbrook Research Institute), Microfiche collection. The published Westford town record book provides the same information. This record is likely a Derivative Source because it appears to be recorded in one hand with all entries recorded at the same time; it was probably transcribed from an older Westford town record book. I searched for the older book in the Ancestry collection, but did not find it. The pastor who originally recorded this is "Willard Hale Pastor." His full name is provided two entries above the Hildreth/Prescott entry. Note also that the words "New Style" are on the right-hand page - this reflects the Julian to Gregorian calendar change on 25 March 1752/3. Zachariah Hildreth (1728-1784) and Elizabeth Prescott (1734-1812) are my 5th great-grandparents. I am descended through their son, Zachariah Hildreth (1754-1829), who married Elizabeth Keyes in 1777.